Since its foundation 65 years ago, Sagamiya Foods has grown into Japan’s leading tofu manufacturer. 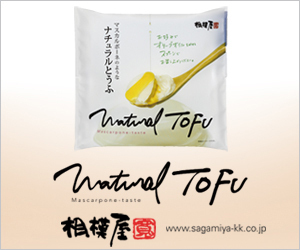 Sagamiya Foods has captured the leading share of the tofu market. Headquarters: Maebashi-shi, Gunma Prefecture in Japan. Sagamiya Foods has been producing Soy food products of excellence in terms of safety, freshness, taste and attractiveness due to our technological strength, unique ideas and the biggest Tofu manufacturing plant in Japan. Sales of Sagamiya Foods has been multiplied by 5 for these past 9 years and we now aim at multiplying the sales to 100 billion yen in the future in the Tofu and other Soy food products markets. Sagamiya foods is managed by Mr.Torigoe, the president of Sagamiya Foods, under his great leadership.